Pneumatic conveying systems for pulverulent bulk goods such as cement, raw meal, lime and fly ash often have to feed several silos one after the other. For many years the IBAU Two-way valves are being used for changing the direction of flow in pneumatic conveying lines. 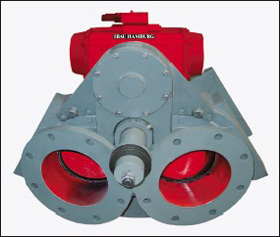 The principle of these valves is straightforward and well-known. A cast iron housing has one inlet socket and two discharge spouts. One of the discharge spouts is always closed by a spring-loaded disc and can be switched either manually or by a pneumatic piston actuator. 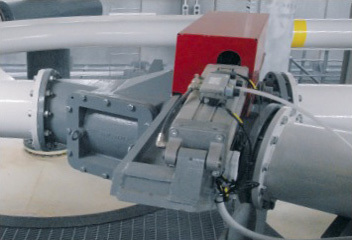 A torque motor with gear and brake forms the electric motor actuator. It’s used to make sure that the final position is correct. Of course, all remote controlled valves are equipped with limit switches. Two-way valves without actuator can have limit switches as an option. Limit switches can be of the conventional type as well as of the proximity switch type.